Over the past couple of years, link building has become a lot more resource heavy. Gone are the days when you could survive by using a selection of cheap automated tools - quality is everything now. The only problem for webmasters is that this takes a lot of time. I'm going to share a process that I use for link prospecting and outreach that will save you hours of time. 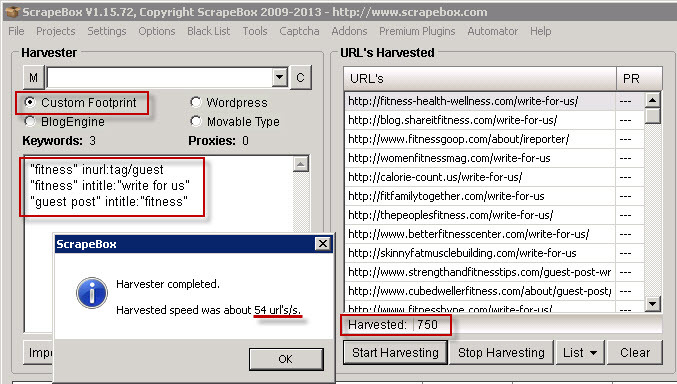 Scrapebox is traditionally a black-hat SEO tool that is used for spamming large numbers of blogs with spun comments. What a lot of people don't realise is the incredible scraping features of Scrapebox that can be used for link prospecting - without spamming a site. You then need to tick the 'Custom Footprint' radio button - this will make sure that ScrapeBox searches through all the different types of websites possible. Then all you need to do is press 'Start Harvesting' and within around 30 seconds you will have a shed load of possible prospects (I gathered 750 from my queries). Another fantastic feature of ScrapeBox is that it will bulk check all of the URLs that you have harvested to find the PR of the domain or the actual URL itself. This is a handy way of initially prioritising your links and it only takes around a minute to do. All you need to do is click on 'Check Pagerank' on the right-hand side and then select 'Get Domain Pagerank'. Let ScrapeBox do its thing and after around a minute you will have the PR score for all of those URLs - awesome! 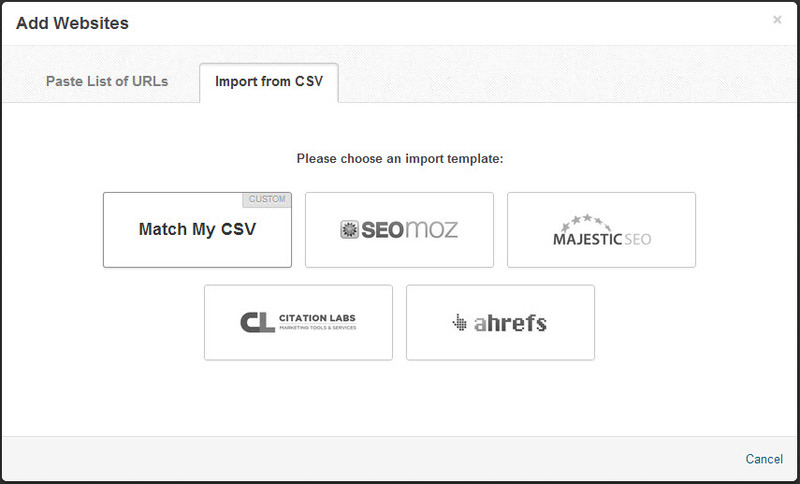 On top of that, you can also export it to a .csv using the 'Import/Export URL's & PR' button. After scraping hundreds of different URLs, it's unlikely that all of them are going to be legitimate link prospects. If I then said you had to manually trawl through the list of URLs to find good ones then it would defy the whole point of this post really. This is where Screaming Frog SEO Spider comes in. The first thing to do is set Screaming Frog to 'List' mode. To do that, navigate to Mode>List (as shown above. Before you upload your list of scraped URLs to Screaming Frog, you will then need to set up some custom filters. The custom filters will look through the HTML of the pages that you have scraped and search for specific phrases that appear. You can add these filters by going to Configuration>Custom. I always use these two phrases (in the image above) because if you start putting in 'guest post', 'guest author', etc, you will end up with a load of blogs about guest blogging - which isn't ideal. You can now upload the .csv file with all of your scraped URLs then let Screaming Frog works its magic. Once it has processed all of the URLs, click on the 'Custom' tab to the right and you will get a list of the filtered URLs. From my initial 750 URLs, I've filtered it down to 241 relevant link targets - all within a couple of minutes. So now we have a pretty list of 241 relevant websites that we can look at getting links from, it's time to start gathering their contact details. This is where the next tool comes into play - BuzzStream. BuzzStream is a fantastic link building tool that has a variety of different features (too many to cover in this post). The feature that I'm going to focus here is for gathering contact details from our target websites. It's worth noting that you need to signup for BuzzStream to do this, but you can take on a 14 day free trial that will give you full access. 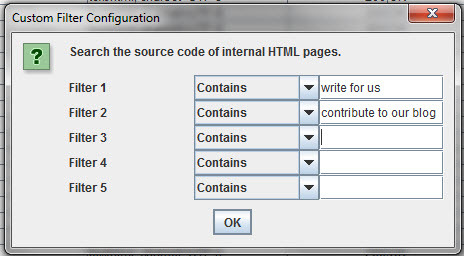 Within BuzzStream, go into your website's project and click the 'Add Websites' button and select 'import from existing file'. You can now upload your outreach targets from Screaming Frog into BuzzStream and after around 15 minutes, BuzzStream will have gathered a load of contact info that will have saved you hours of trawling through websites. After a grand total of around 25 minutes, I've now got over 170 niche-relevant link targets with all of their contact information and social media profiles. All that is left to do is begin reaching out to webmasters through BuzzStream's email interface and you're on your ways to building some relevant links! 241 link targets to 170 e-mails? Wow. BuzzStream sure has improved. We might have to reevaluate this. I looked at and tried BuzzStream for our team a year ago, and due to the lack of adoption from our current methods we stopped. This is very interesting, thanks. Hey Vic, I’ve been using BuzzStream for just under a week now and it has been a revelation so far. What you have to bear in mind as well is that by using this process you will often find websites that openly give out their contact details – which makes it much more effective. I’ve been showing Matt around both BuzzStream & ScrapeBox, Buzzstream has grown a hell of a lot since I started using it (Around 7 months ago) and offers a pretty comprehensive suite of tools! I’d recommend it wherever I can! Scrapebox is not actually blackhat tool, its a scraper. The days when only blackhats used tools are over 🙂 GOod post! Agreed – however, there are definitely some direct uses of ScrapeBox that can be applied for black-hat SEO (i.e. automated comment spamming). Thank you Matthew, It’s a great way. No problem, Andy. Glad you found it useful! Great job Matt. I’ve been slowly converting all nay-sayers to Scrapebox for months. It’s great at organising data and in combination with BuzzStream it’s unstoppable! Thanks Sebastian – I’m a real big fan of ScrapeBox; it’s just so quick at retrieving data. When you combine it with other tools it can become an extremely powerful SEO tool. When link prospecting, I also take note of the social shares of the site’s contents and their domain authority as one of my “qualifier”. I especially like looking at the social shares. Chances are, if I’m able to guest post for that site, my guest post will also be shared by the site’s community. Thanks for sharing Matt. Awesome post! Totally agree, I use Ahrefs as their social metrics are a lot more reliable than OSE and it also displays their backlink social signals so you can look at a potential target and see what pages got social shares, if their backlinks have good social signals etc.. The more social engagement the better brand you’re building around that guest post! A very good point. I often take a good look into the comments and social signals with many of my link targets – often is a good indication on how valuable your link will become over time. Most of what you said can be done just with the help of Scrapebox, Not much need of Screaming Frog & BuzzStream. You can replace Screaming Frog with “Page Scanner” addon of Scrapebox & BuzzStream can be replaced by using Email Grabber in SB (Though BuzzStream gathers a lot of other essential details too). Plus you can check the Page Authority of your gathered links using “Page Authority” Addon of SB (need to setup Moz API though). Doesn’t page scanner just scan individual pages and screaming frog can scan the whole site? I use Buzzstream and I have seen a lot of great results when you really customize the emails as much as possible. It is good to start with a template, so that you can get a good base with your email and then you can use their software and customize the email within the software.